Abdiwali Nur, a former resident of Minnesota, is believed have died while fighting for ISIS in Syria. Nur is believed to have traveled from Minneapolis-St. Paul, Minnesota, to Syria via Turke in May of 2014.Ed Payne, “More Americans volunteering to help ISIS,” CNN, March 5, 2015, http://www.cnn.com/2015/03/05/us/isis-us-arrests/. According to the criminal complaint and documents filed in court, while in Syria Nur sent messages via Facebook to contacts in the United States claiming that he had gone “to the brothers,” and that “[we] will see each other in the afterlife inshallah.”Peter Sullivan, Two Minnesota men charged with aiding ISIS,” Hill, November 25, 2014, http://thehill.com/blogs/blog-briefing-room/225305-two-minnesota-men-charged-with-aiding-isis. In November 2014, a Minneapolis federal court charged Nur in absentia with conspiring to aid ISIS.Ed Payne, “More Americans volunteering to help ISIS,” CNN, March 5, 2015, http://www.cnn.com/2015/03/05/us/isis-us-arrests/. A June 2016 trial found Nur’s co-conspirators, Guled Ali Omar, Abdurahman Yasin Daud, and Mohamed Abdihamid Farah guilty. During the trial, an FBI officer alleged that Nur’s relative, Mohamad Roble, had traveled to Syria in October 2014.Aamer Madhani, “3 Minneapolis men found guilty in plot to join ISIL,” USA Today, June 3, 2016, http://www.usatoday.com/story/news/2016/06/03/3-minneapolis-men-found-guilty-plot-join-isil/85355076/. 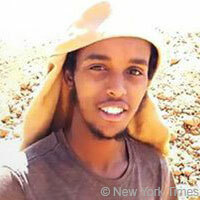 Nur’s travel to Syria is believed to have inspired nine of his Minnesota-based friends—Abdullahi Yusuf, Abdirizak Warsame, Zacharia Yusuf Abdurahim, Adnan Farah, Hanad Mustafe Musse, Hamza Naj Ahmed, Guled Ali Omar, Abdirahman Yasin Daud, Mohamed Abdihamid Farah—to conspire to provide material support to ISIS. Many of them attempted to travel to ISIS-controlled territory to join the terror group.Laura Yuen, “3 of 9 Twin Cities men sentenced in ISIS conspiracy trial,” MPR News, November 14, 2016, https://www.mprnews.org/story/2016/11/14/first-day-of-sentencing-isis-trial. Abdi NurEd Payne, “More Americans volunteering to help ISIS,” CNN, March 5, 2015, http://www.cnn.com/2015/03/05/us/isis-us-arrests/. Abdiwali Nur, a former resident of Minnesota, is believed have died while fighting for ISIS in Syria. “[I have gone] to the brothers, [we] will see each other in the afterlife inshallah… I’m not coming back.”Peter Sullivan, Two Minnesota men charged with aiding ISIS,” Hill, November 25, 2014, http://thehill.com/blogs/blog-briefing-room/225305-two-minnesota-men-charged-with-aiding-isis.